The second and third weeks of November saw an attack on the Shia Hazaras every other day. While the Human Rights Commission of Pakistan has stated that more than 800 Hazaras have been killed since 2001, the figure must surely have gone up given the increasing number of attacks. As it is, around 112 people have been killed and more than 148 Hazaras were injured in 58 incidents in 2012 alone. Majority of the concerned parties remain aloof to the situation in Pakistan, with the perpetrators of this violence roaming freely. Amidst an increasing sense of insecurity among the members of Hazara community in Quetta, human rights groups and Hazara diaspora have been busy raising the issue in the West. At a recent conference held in Gothenburg, Sweden aimed at highlighting the “genocide of Hazaras in Pakistan,” more than 200 people were in attendance, including human rights activists and members of civil society. Historian, writers and rights activists spoke at the conference including Ali Dayan Hassan of Human Rights Watch and Professor Dr Ishtiaq Ahmed of Stockholm University. “The Human Rights Watch believes that Hazara face a double jeopardy due to their sect and ethnicity. This has created a sense of extreme insecurity among the Hazara community, particularly in the city of Quetta,” Hassan said, while speaking to the conference via a video link. “We have found the Baloch actors within the Government of Balochistan to be publicly unsympathetic to the plight of Hazaras,” he said, criticising the government of Balochistan. Whether the law enforcement agencies back such crimes or at least tolerate the killings, the professor was of the view that it was more likely that the mindset which was created for strategic purposes is now out of the control. “You create the monsters but you can’t control them,” he said. A resolution was unanimously adapted at the conference asking the Swedish government and European Union to pressurise the government of Pakistan to protect its ethnic and religious minorities. A few days earlier, on November 19, the British House of Commons in London hosted a similar conference, which was attended by 20 MPs, including Mark Lancaster (Conservative), Jim Cunningham, Lain Stewart (Conservative), Alan Johnson (Labour), John Denham (Labour), Robert Buckland, Lord Avebury, Tobias Ellwood, Eric Lubbock (Liberal Democrat), Andrew Smith (Labour), Jon Wheale (Labour), John McDonnell, Mark Pritchard, Stephen Pound, Caroline Noke among others. British human rights activist, Luci Woodland criticised the international media, particularly British media for being biased and keeping mum over Hazara killings in Quetta. She brought to notice that at least 20 Hazaras were target killed in Quetta when the entire British media was covering Pakistani cricketers’ match-fixing case bit-by-bit. 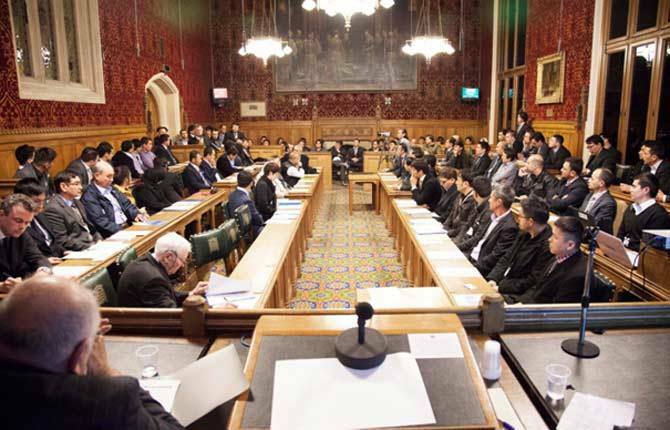 “Hazara students are not able to attend colleges and universities in fear of getting attacked and the community is under siege,” said former British Home Secretary, MP Alan Jhonson He informed the house that despite having discussed the issue in an adjournment debate in the parliament in March and having conveyed their concerns to the Pakistani High Commission in London, the Hazara killings never stopped nor did the government of Pakistan arrest the killers.